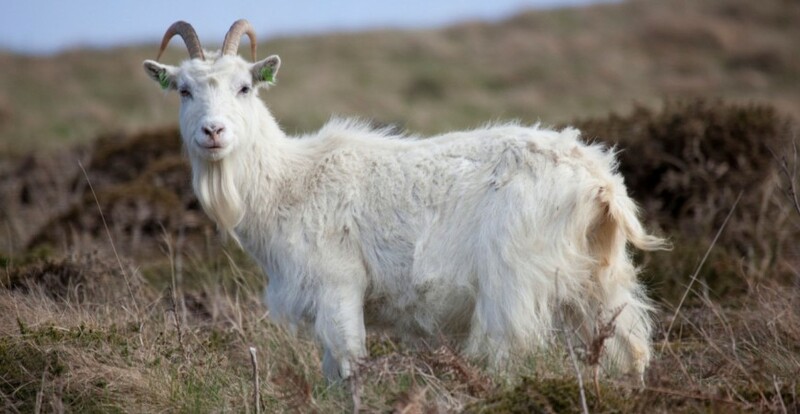 Cashmere goat is a common designation for any breed of goat that produces cashmere wool. Among these, the Himalayan cashmere goat is a specific long-haired, high elevation species, inhabiting various mountain regions of the Himalayan countries, and is found in Pakistan, northern-India, Nepal, Tibet and China. The native Cashmere goat of Nepal is called Chyangra, and lives in mountain areas at altitudes above 3000 meters. The Chyangra cashmere goats are free-ranging and feed on grass in the high plateaus of Nepal. In order to adapt to the harsh temperatures during winter, the goats have developed a double fleece consisting of an outer sturdy protective layer, and an insulating warm undercoat made of ultra-fine hairs. During spring time they naturally shed their soft, insulating undercoat, which will regrow in the winter season. Chyangra cashmere goats are also known under the name Chyangra pashmina goats.